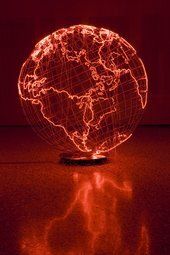 In relation to art, the term diaspora is used to discuss artists who have migrated from one part of the world to another, (or whose families have), and who express their diverse experiences of culture and identity in the work they make; often expressing alternative narratives, and challenging the ideas and structures of the established art world. This has become a potent subject in art and can be related to movements in art like relational aesthetics and altermodern. This discussion focuses on issues relating to the practices of contemporary artists and curators of the black diaspora.